This is my entry for the Columbus Artists’ Guild 2013 Exhibition. The opening reception is on June 8, from 6:00-8:00, at the Illges Gallery, inside the Corn Center for the Visual Arts, part of CSU’s River Park Campus, corner of Dillingham Street and Front Avenue. Public is welcome and the reception is free. 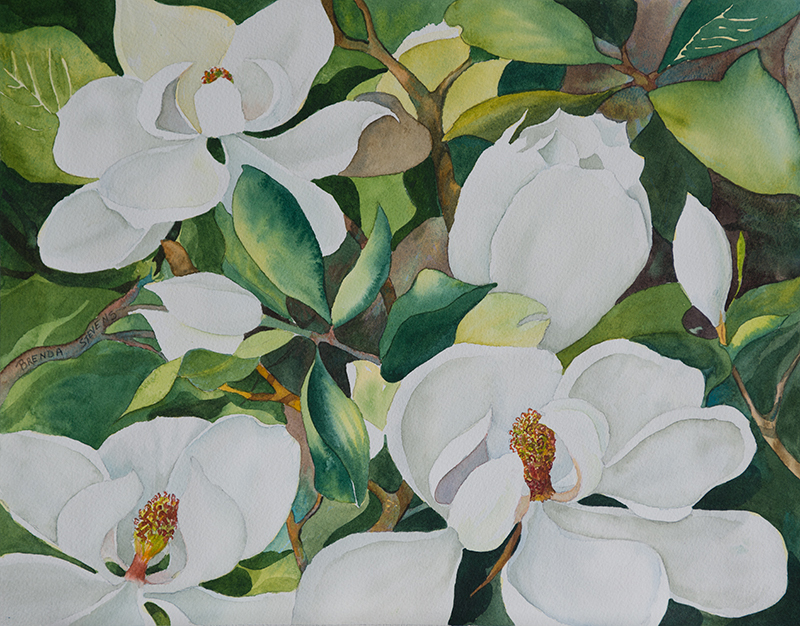 My painting, “Southern Magnolia” was inspired by a fresh palette of colors; Cerulean, Antwerp, Cobalt and Ultramarine blues, Aureolin, Winsor and Gamboge yellows, and Permanent Rose, Scarlet Lake and Winsor reds. With this primary palette, I mixed all of my greens and browns. I simplified the shapes in my composition and did a value study before starting. This planning allows me the pleasure of spontaneous experimentation during the painting process.